Evolution teaches that the universe and the earth are billions of years old. 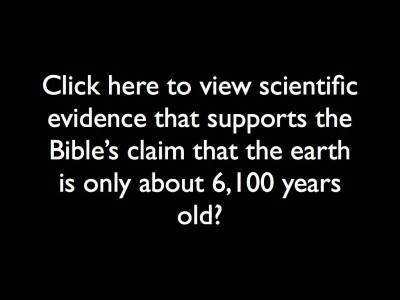 If you add up the numbers in the Bible, you come to the conclusion that the universe and the earth are about 6,100 years old. This is a big discrepancy. How should those of us who adhere to the Bible respond to this significant difference? The answer is that there are two significant flaws in how evolutionists calculates their dates. The first flaw is that evolutionists assume a consistent rate of change. For example, one way of dating the earth is to look at the Grand Canyon, calculate how fast erosion is taking place, and then calculate how long it would take to create the Grand Canyon based on the rate of erosion. The next conclusion is that the earth is at least old enough for the Grand Canyon to have been created. One flaw here is the assumption that the rate of erosion has always been the same. How do we know that the rate of erosion was not significantly different 2,000 years ago? Was anyone measuring the rate of erosion 2,000 years ago? Perhaps the amount of rainfall changed significantly over the centuries? Perhaps there was a layer of rock or dirt that eroded much quicker than the layers being eroded today? This flaw also applies to other dating methods such as radiometric dating and observation of the movement of the stars. Scientists have only been measuring these things for about a hundred years, so when they arrive at the conclusion that the universe and/or earth is billions of years old, they are making a very large assumption that the rate of change has been consistent for billions of years. Scientists have not been collecting data long enough to make that kind of assumption. The second flaw is that evolutionists make assumptions about the starting point. For example, when the age of the Grand Canyon is calculated, scientists look at the rate of erosion, calculate how long it would take to create the Grand Canyon based on the rate of erosion, and then conclude that the earth is at least old enough to create the Grand Canyon. This whole calculation assumes that at one time the entire Grand Canyon was filled in and was a flat piece of land. How do we know that that was the starting point? Perhaps the Grand Canyon was already a deep canyon at the moment the American continent came into existence. Another example of this assumption is in astronomy. Astronomers have observed that stars are moving away from a central point in the universe. After measuring how fast the stars are moving away from this point, they calculate the age of the universe by calculating how long it would have taken for the stars to move from this central point to where they are now. Again, how do we know that the stars started at that point. Just because they are moving away from that point doesn’t mean they started at that point. Here is an illustration of how absurd these dating methods are. Imagine that a car pulls up to the beach in Atlantic City, New Jersey going 35 MPH. Now imagine that someone concludes that since the car was going 35 MPH and Los Angeles is 2,780 miles away, that the car has been moving for 79.4 hours. There are several assumptions here. The first assumption is that the car started in Los Angeles. The second assumption is that the car traveled 35 MPH the whole way from Los Angeles. Are either of these assumptions valid? If you were on the beach in New Jersey and saw a car arrive, would you assume it had started in Los Angeles and traveled the whole way at the same rate of speed? No, you would not assume that, but that is what some scientists are doing. They make observations about processes that are happening in the 20th and 21st century, then they make assumptions about the starting point and they assume that the processes have been happening at the same rate for billions of years, even though they have only been measuring these processes for a century or two. Evolutionists like to treat creationism as if it is foolishness, but the true foolishness is found in evolution and their methods of dating the earth. Those of us who believe in the Bible can be assured that science has not proven the Bible wrong regarding the age of the earth, because evolutionists are basing their conclusions on faulty assumptions. Do you believe this website is valuable to yourself and others? If yes, please consider making a financial contribution so that I can continue writing these posts and reach more people with Biblical truth. ← Are we allowing ourselves to be stained by evolution?